This gray cubicle needs some life. It needs a garden! Given a choice of where to plant a garden, I bet most gardeners would choose their backyard or community garden. For me, it’s my desk … at work. With winter in full swing and the ground hard as a rock, outdoor gardening is not an option for the next few months. How do I harvest crops from my desktop? I use the My Greens Light Garden. Cubicle farm, as defined by the Urban Dictionary: Monotonous office environment characterized by white-collar slaves, wasting their lives in pseudo-offices with four- foot walls, while slowly morphing into zombies. I planted my first seeds in December: romaine lettuce, a microgreens mix, wheatgrass, lemon basil and calendula, for some winter color. The system is easy to assemble. Within a few minutes, I had the trays filled with moistened planting mix. A capillary mat draws water from a reservoir under the growing trays, ensuring that the planting mix remains moist, but not too moist. Once the seeds were planted, it was time to wait. I felt like a child at Christmas; the waiting was unbearable. But, the growing conditions were perfect: moist soil, temps in the mid-60s — and sunny every day! 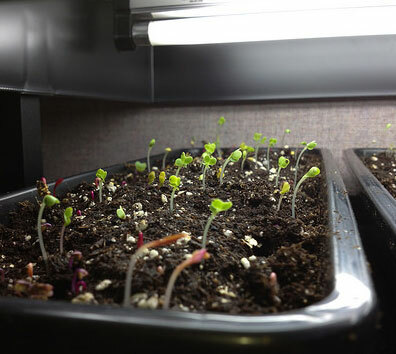 Thankfully, I only had to wait four days before the microgreens, wheatgrass and lettuce seedlings burst through the soil, reaching for the ceiling. I lowered the light and topped off the water reservoir. Easy peasy lemon basil squeezy! To make it even more automatic, I added a power strip with a timer and set it for 17 hours of “sun.” Seems like a lot of light, but that’s what seedlings need. This illustration shows how the garden works. Water in the reservoir is drawn up to the growing trays via the capillary mat. It works like a wick. As the plants grew, I kept an eye on the reservoir to make sure it was not getting too low. It wasn’t long before I knew I’d chosen an incompatible group of plants. The wheatgrass grew at two or three times the rate of the other plants, something I didn’t foresee. “What’s the problem with that?” you may ask. Well, it makes it hard to keep the light source close to all of the seedlings. Although it seems really close, you need to have the light just an inch or two from the top of the plants. Too far away and you start getting leggy seedlings. As a result, I had to cut the wheatgrass once or twice a week to keep the light at the appropriate height for the rest of the vegetables. A small problem to have, for sure, but I wish I’d planned better. When choosing crops, use the seed packets to get an idea of how fast things grow. A month after planting, the romaine lettuce was almost perfect for some baby romaine salads, the wheatgrass continued to grow and the lemon basil was about ready for some cocktails. I ate some of the microgreens and they tasted great. My calendula was still growing and I was looking forward to flowers soon. Another good reason to add a timer: Vacations. I was out for 10 days, but I knew the “sun” would shine on my seedlings every day. That being said, I was a little worried about water. Fortunately, I have some great co-workers who were more than willing to monitor the water level. It took just one filling while I was gone. All was well when I returned, though the plants were much bigger. I would say the system can make it five to seven days without any refilling, but it’s always best to have someone help with watering duties. I have since harvested my last microgreens, cutting them all to the soil level. I gave the stems and leftover leaves to my chickens and replanted the tray with radishes. I think this system is set up wonderfully to try different vegetables and greens. You don’t always get a huge harvest, but sometimes it’s more about the experience. 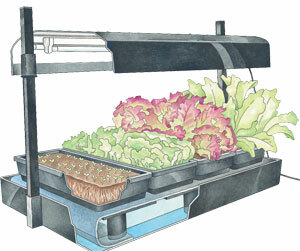 This system would be great for the kitchen gardener, growing herbs and small leafy greens with ease and little effort. Gardening indoors in my cubicle has been a great cure for the winter blues, and provided some great motivating visuals for my co-workers. 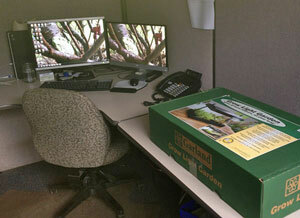 Spring may be a distant dream, but a dream that comes true every day when I get to work and see my garden. 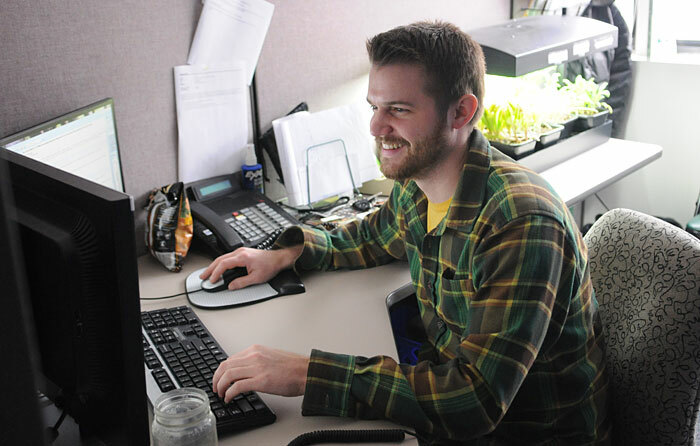 While he creates new marketing strategies for Gardener’s Supply, Chris is growing his own salad.